Speaking Tests can be time-consuming for both examiners and moderators. Each student must be taken out of the class to be interviewed. When the tape, disc, or file is recorded, forms must be filled out, and the tape accurately labelled and posted to the correct location (in the case of some exams, to several different locations depending on the candidate). Each track number must be carefully noted with the candidate’s name and number. Once sent off, it can be difficult to keep a copy of the examination for the centre’s reference. Due to postage and processing times, there can be a considerable delay before reception of the recording at the examination board. No paper forms are required and much information can be filled out automatically. Examinations can be stored for as long as required. The procedure for entering an exam is simple. No software installation is necessary. Simply go to lab.schoolshape.com and log in. First, a list of the students’ names is pasted into the system. Next, click ‘enter exam’ and select your exam from the list provided. The next screen helps you fill in details required by the exam board. As many details will be the same for most students, the first item you enter in each column will be copied down automatically, and you can then edit any exceptions. You may wish to start by making a test recording to check your microphone is working. 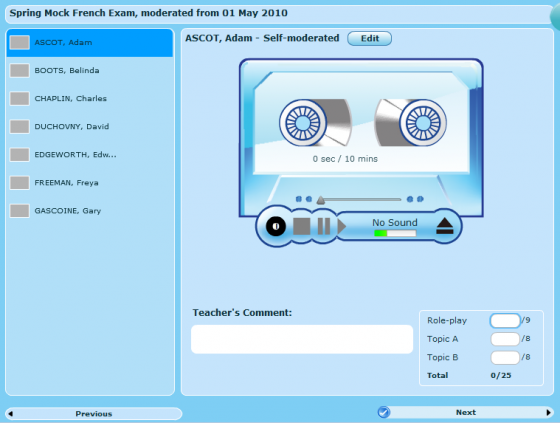 Click the round ‘record’ button on the tape and record your test. Schoolshape will warn you if the recording level is too low. You can play it back by pressing the triangular ‘play’ button. When you are satisfied, click on the first student’s name and call them in to record the exam.